Bahamian food is such a diverse rich experience. It would be a real shame to visit the Bahamas and not experience the food of the locals. The unfortunate thing is that the main restaurants in Nassau do not pay tribute to the local palate. The fortunate thing is Checkers Cafe serves many local dishes the way locals like them at the price that locals like. Because Checkers Cafe caters to the local people, it is a little off the beaten path. To get there a taxi ride will be in order. Bahama John is a local taxi driver who is recommended by many as a good driver with good knowledge of the island. Checkers Cafe servers the dishes that most bahamians grew up on in the more rural parts such as the other inhabited islands of the Bahamas. Lots of the food has it’s roots in the Cajun parts of the USA. There are foods that resemble such things as Gumbo. One of my favourites is called Stew Conch. It is a bahamian gumbo cooked with the meat of Conch. They will serve other things such as “Steamed Pork Chops,” Peas-n-rice,” “Steamed Chicken…” The Steam food is not at all steamed as you would think, but is cooked in a rich tomato gravy sometimes with potatoes and carrots as well as the meat. I suppose it is more like a stew. Breakfast is also rich. Bahamians don’t traditionally eat eggs and bacon. Rather things like “Stew Fish” or “Steam Fish and Grits” There is even one called “Fire Engine.” I have taught many friends from different countries how to cook this traditional breakfast, and years later they cook it more than I do. So please step out and experience a little of the Bahamas while in Nassau. Check out Checkers Cafe. The East Villa Restaurant is a bit of a walk from Paradise Island. It can be done! If you are not up for the walk, it is one of the Restaurants that is a must in Nassau. So get a Cab. This is one of my favourite restaurants in Nassau. Not only is the food good, but the atmosphere is also good. I enjoy being able to sample foods that I may not have ordered as they are set in the centre of the table. My kids also enjoy going here, they seem to think it’s great fun. The East Villa has been serving it’s mouth watering dishes for more than 20 years. They have a reputation not only for great Cantonese, and Szechuan food, but the also do a mean steak. The duck is out of this world. I know if you like duck you’d appreciate the duck at the East Villa. The restaurant is a family style setting. Order several Entrees and a few appetisers. They all go onto the lazy Susan in the centre of the table. This is a lot of fun because of the variety that can be enjoyed at one meal. There is also a full bar. The bar tender will be happy to make those wonderful tropical drinks that slide down much too easily. The Bar Tender will also be able to make any of your normal drinks. Pricing ranges from $15.50 to about $32.00 per Entree. Bring your appetite and enjoy. 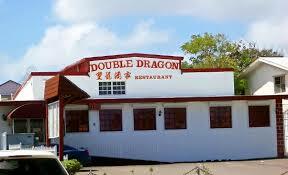 The Double Dragon is another restaurant within easy walking distance of any of the hotels on Paradise Island. To get to the Double Dragon Restaurant walk over the bridge with traffic leaving the island. Once on top of the bridge you should be able to see the Double Dragon off to the left. It is a white building with a parking lot in front of the restaurant. The food is really good and priced for the locals. They do both dine in and take out. Double Dragon is open for lunch and supper Monday through Saturday, and open for supper on Sunday. Entree items range in price from $9.00 to $12.00 for lunch and $13.00 to $28.00 for dinner. The take out menu is priced differently as well. The Green Parrot Restaurant overlooking the harbour. 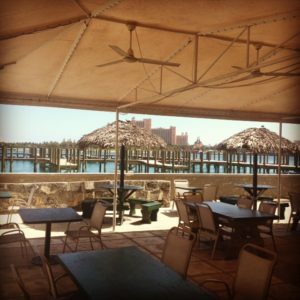 The Green Parrot is a great option for lunch when staying on Paradise Island. It is a pretty easy walk from any of the hotels on Paradise Island. The food is good and economical. The Green Parrot is an outdoor restaurant on the harbour, great for a relaxed meal and a local beer. To get to the Green Parrot take the bridge that brings traffic onto Paradise Island. At the bottom of the bridge take a right and stay on the harbour side of the road. With in a couple hundred yards you’ll see the restaurant. The Green Parrot is open from 11:30 a.m. to 10:00 p.m. every day. The menu prices range from $15.00 to lobster at $36.00. The Green Parrot is also a bar, mixing your favourite tropical drinks or serving the local brew. Paradise Island is a stunning island. The beaches are both gorgeous and great for swimming. There are times of year when the waters can get a bit on the rough side, mostly getting toward the end of the hurricane season. I can remember riding my bicycle with great excitement in the end of August-beginning of September going to Cabbage beach to “ride waves.” The rest of the year the waters are mostly calm. One of the complaints that I’ve heard about staying on Paradise Island is “the food is really expensive.” This next series of short articles will help greatly with the expense of dining on or around Paradise Island. It will also help you to discover some of the local bahamian foods that we enjoy. Obviously the main goal of any resort is to keep you on the resort grounds. There are several reasons for them to keep you there, the main one is the most obvious! They’d prefer to be the ones to provide you with all your needs while staying on the property. That is a nice gesture, but if you are like me at all, I like to experience the places I go the way the locals do. Believe it or not just a short walk away from the resorts on Paradise Island there is a place that you can get a local breakfast for $3.00. While filling a basic need to eat, you’ll be able to enjoy a breakfast that a bahamian would typically eat. The name of the Restaurant is Port Side Cafe. They are there mainly to serve the locals who work on Paradise island, but the food is local, good, and economical. A winning combination I’d say. 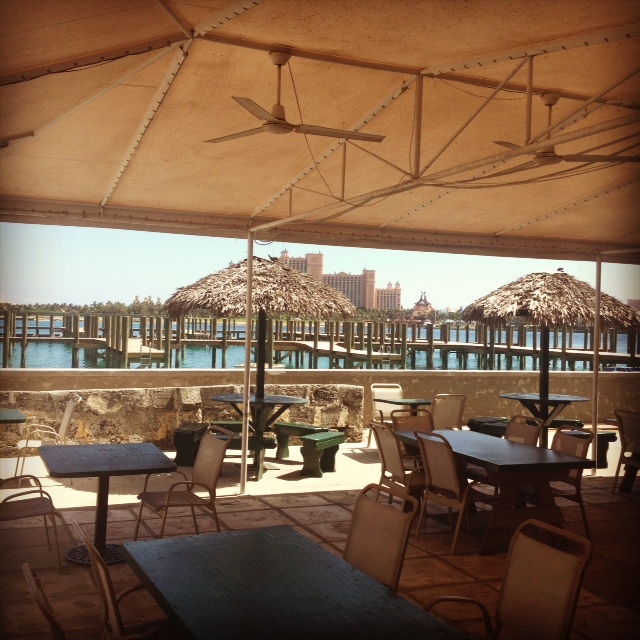 This gem of a restaurant/take out is located under the bridge as it comes onto Paradise Island. There is a marina there, as well as a few offices of tour companies. The Restaurant is open from 7:00 a.m. to 5:00 p.m. They also serve sandwiches and other dishes. The menu price ranges from $3.00 to $12.00.